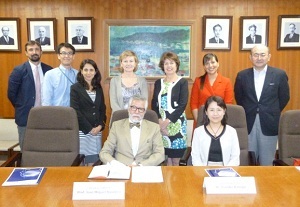 On September 6, 2013, Professor Jose Miguel Aguilera, President of CONICYT and five other representatives paid a courtesy visit to Dr. Fumiko Kasuga, Vice President of Science Council of Japan (SCJ) in charge of International Activities. The purpose of their visit was to explore options of cooperation in science and technology between both countries. Professor Aguilera said CONICYT has funds for human resources development on sciences and technologies and it funded 5000 scientists in 6 years. It also has many scholarships for advancing training of human capital in science and technological research in Chile. In addition, to increase international competitiveness in science, they materialized free access to scientific information and are inviting international experts from all over the world to the international peer review processes for research projects to be funded in 12 fields such as projects relating deserts, Oceanology, Solar Energy System, Astronomy, etc. Being impressed by introducing international competitiveness in Chile, Dr. Kasuga said SCJ needs to learn from Chile. President Aguilera responded that international cooperation is necessary for maintaining Chile's presence. They also exchanged opinions on the organization and roles of SCJ, other activities of CONICYT, etc.